This was drawn with a 3B leaded pencil, on a 8�" x 11" High Bright (87) smooth finished paper. Alright this drawing I'm not to happy about, probably because you can hardly see it. I again copied the orignal drawing with a copy machine. 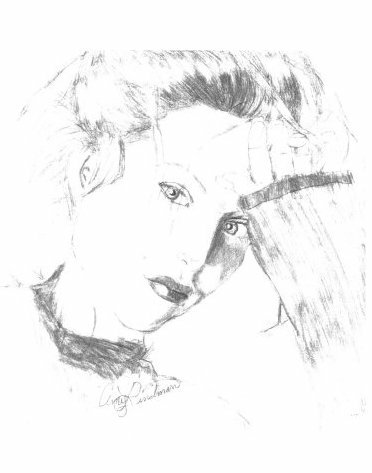 This was the first time I ever drew Gillian Realisticly and the first time that I have ever tried to draw realistily. Before I use to draw line drawing and I wanted to advance. The whole trick to drawing is never draw lines. It gives you a dull and flat look. As you can see I was struggling here .